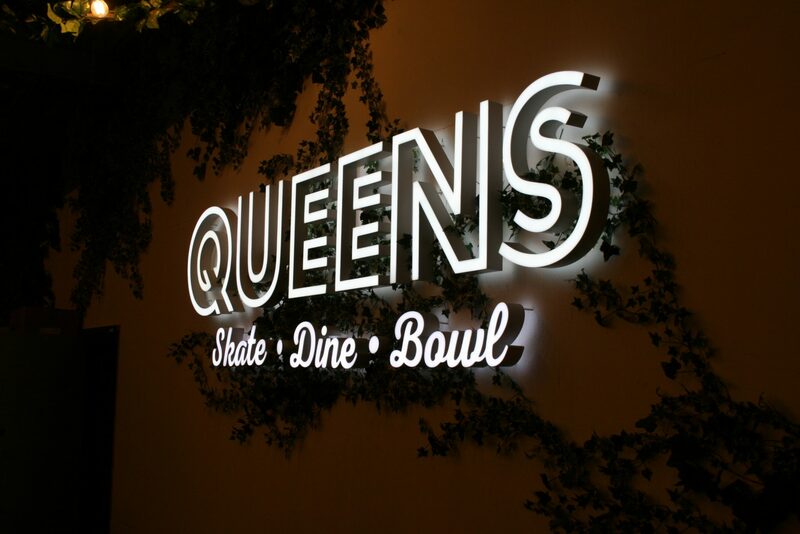 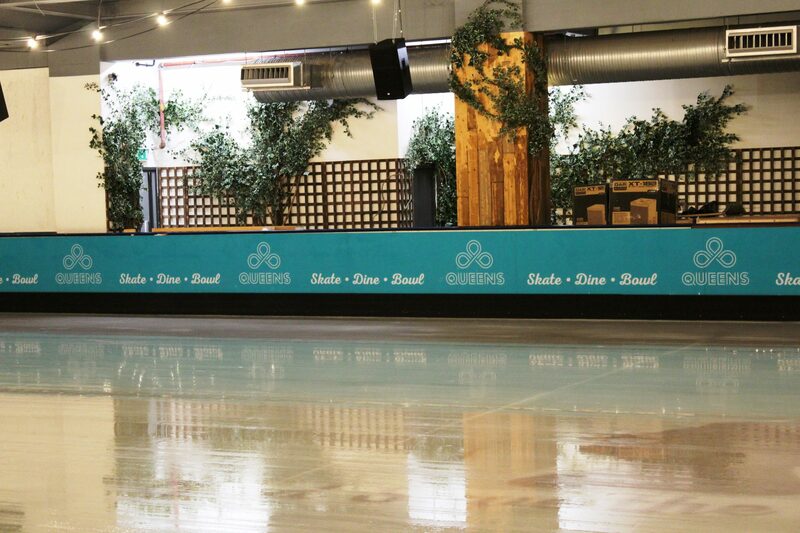 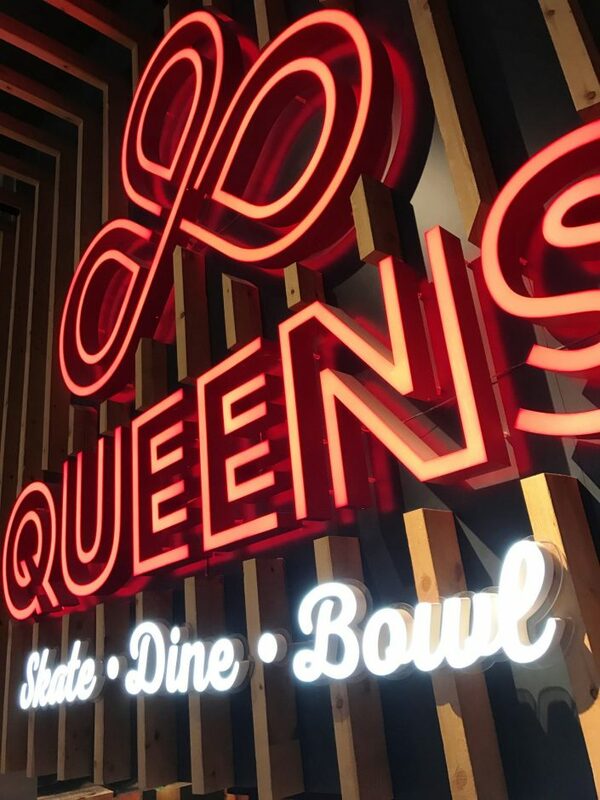 Queens Skate Dine Bowl has been a thriving and iconic London attraction since the 1930s. 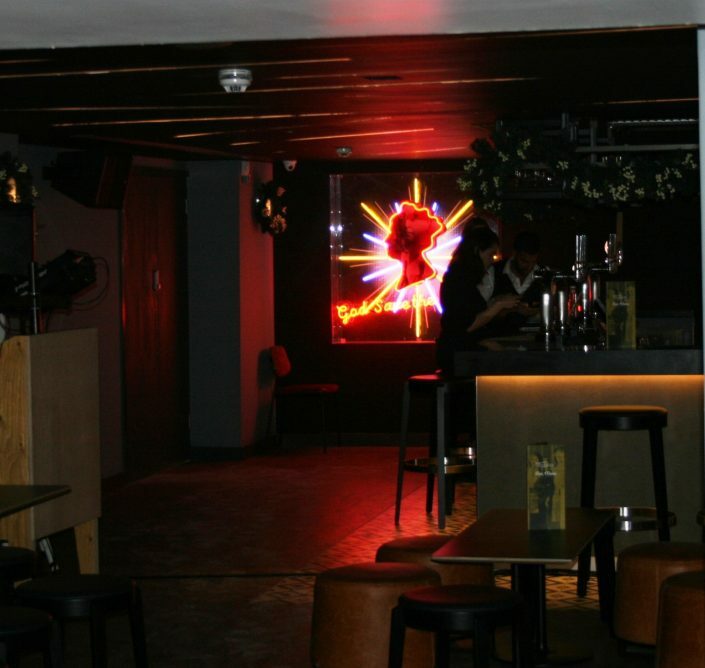 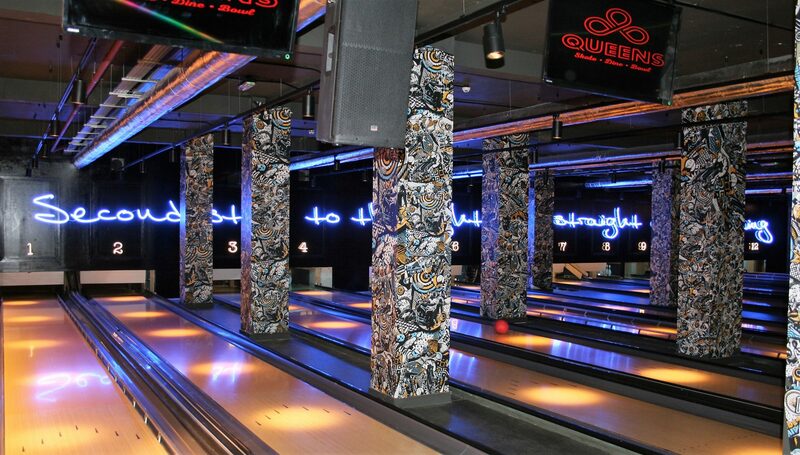 It has recently been given a vibrant revamp and is welcoming its visitors who come to enjoy the buzz on the ice rink, its 12 bowling lanes, private karaoke rooms, cocktails and casual dining. 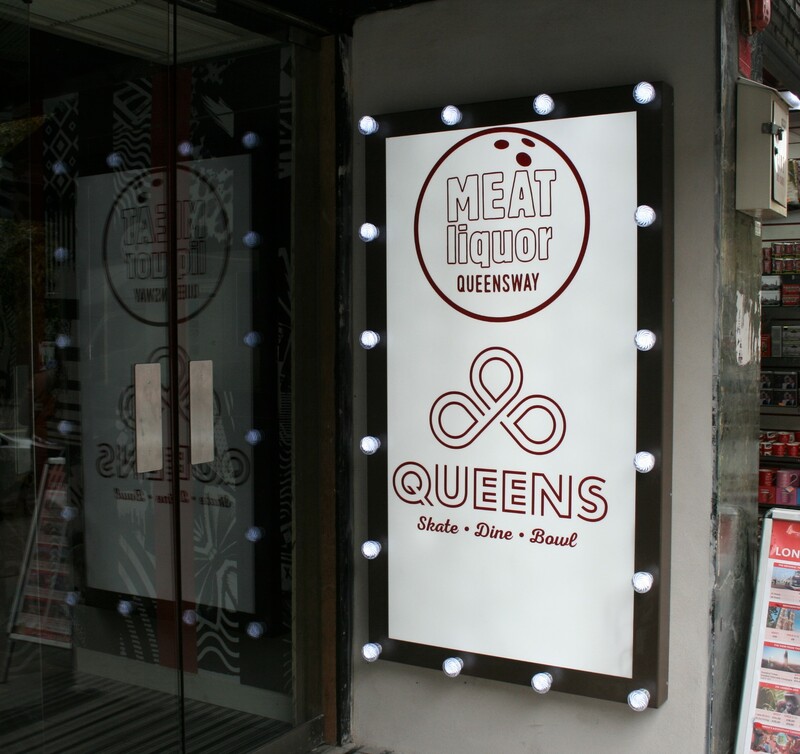 Brief: Working directly for the Head of Marketing at Queens, we were encouraged to suggest alternative signage solutions. Music to our ears! 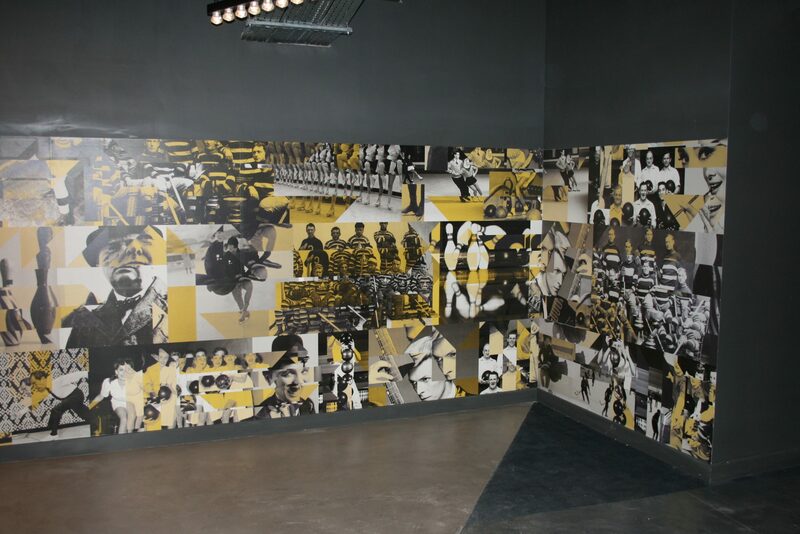 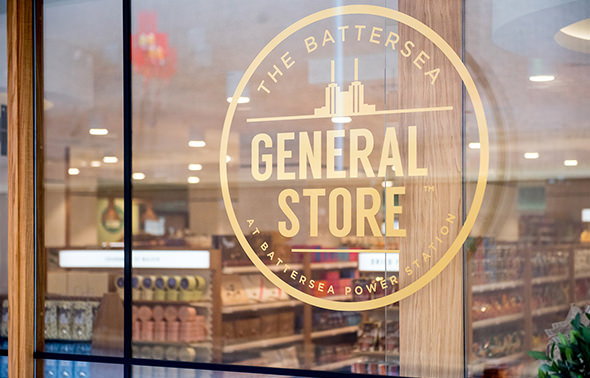 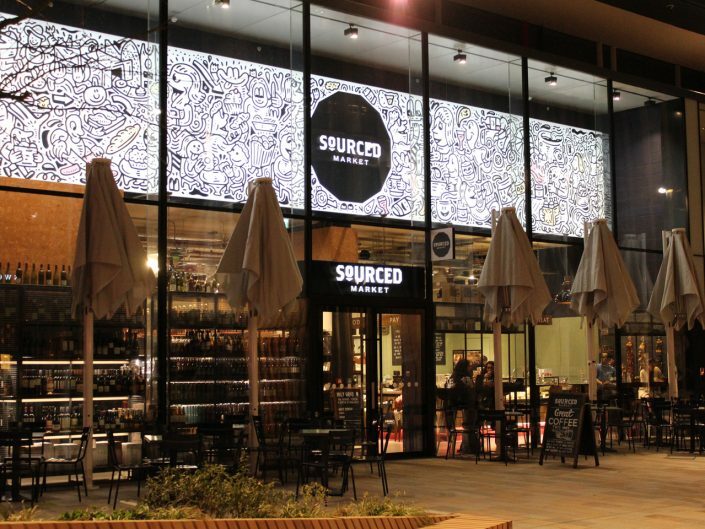 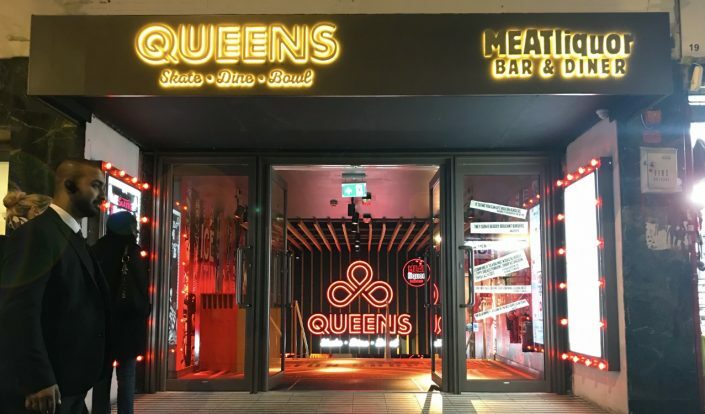 A project of this size, covering so many elements of bespoke signage, allowed us to work in a more creative way, enabling our design team to use their vast experience and knowledge to produce some of our most stunning and satisfying work to date. 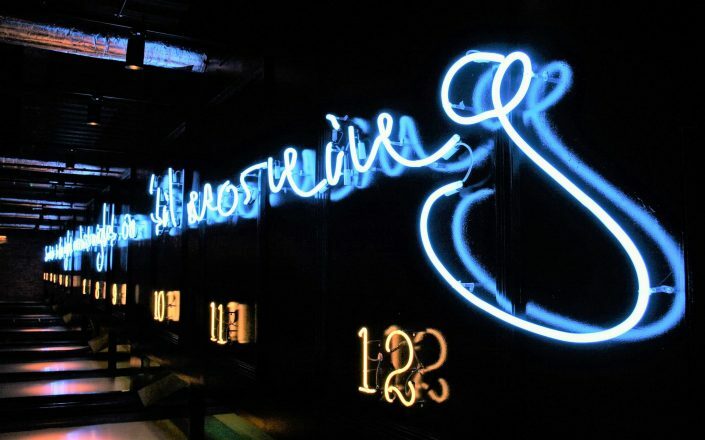 Our suggestion to use our unique in-house design Neon without the Neon© for the main entrance sign was particularly satisfying. The end result looks stunning and justified our client’s belief in what was previously a new idea and concept within the industry. 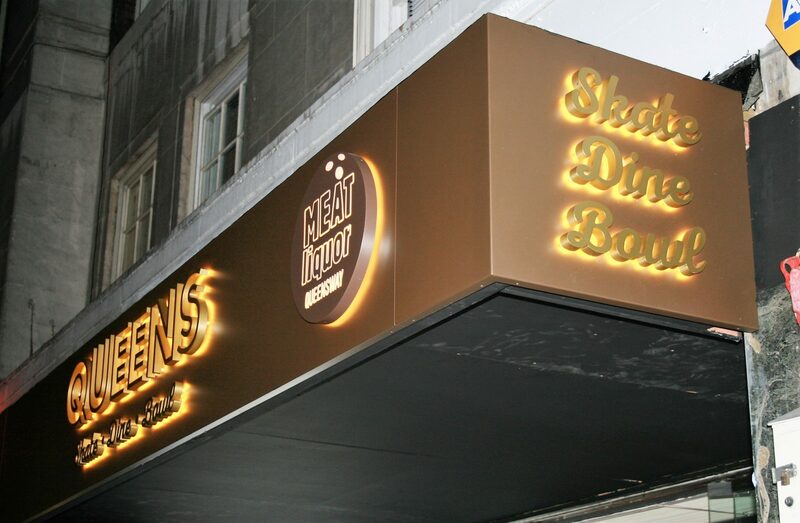 Technical: There were many different elements to this exciting bespoke signage project including the following pieces. The canopy sign at the venue’s entrance was made with folded aluminium and built-up halo illuminated letters and logo. The dazzling bright white logo signage was fabricated from built-up aluminium rimless letters. The letters are internally illuminated with cool white LEDs creating a stunning halo illumination. 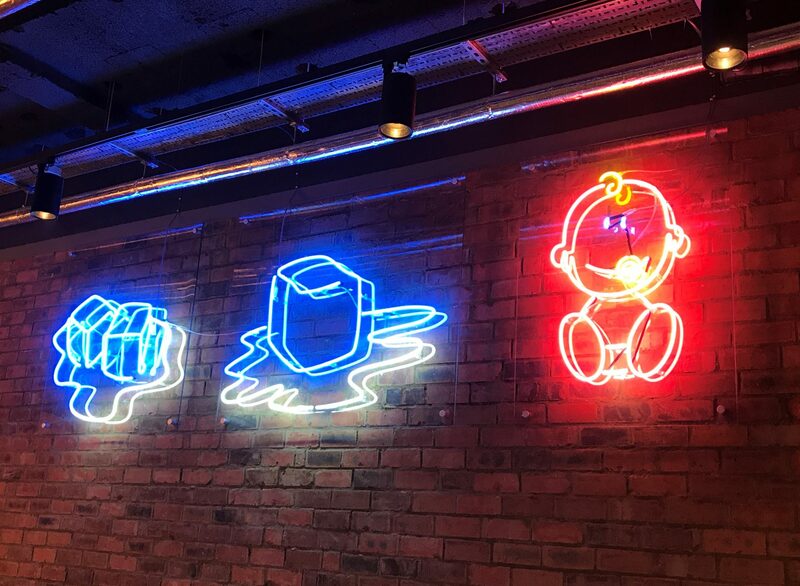 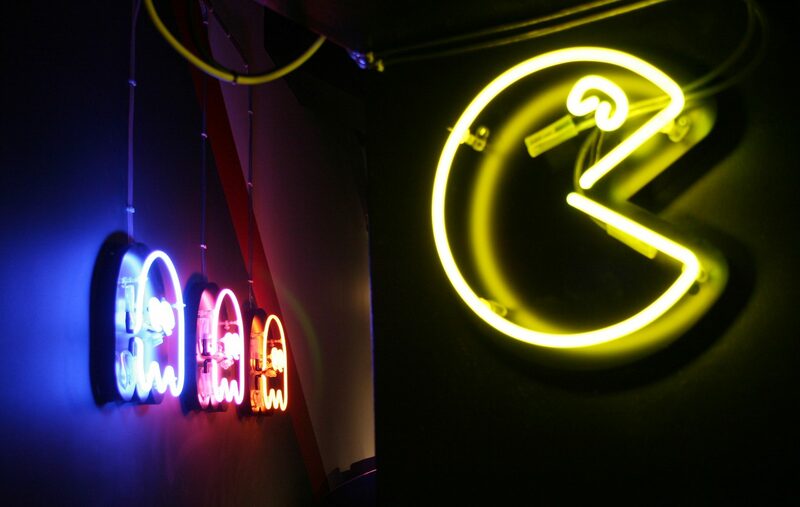 The retro Pac-Man neon signage was created with built-up powder coated panels with multi-coloured cold cathode neon tubing. 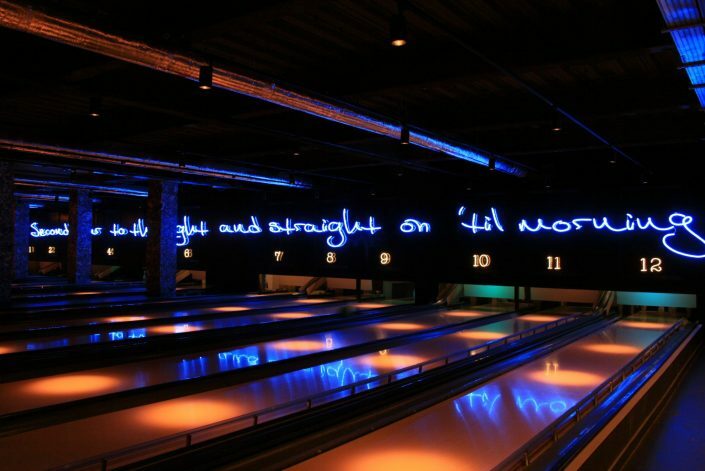 The vast blue neon quote that spans and illuminates the full width of the bowling alley was carefully constructed with built-up 3D rimless aluminium letters. 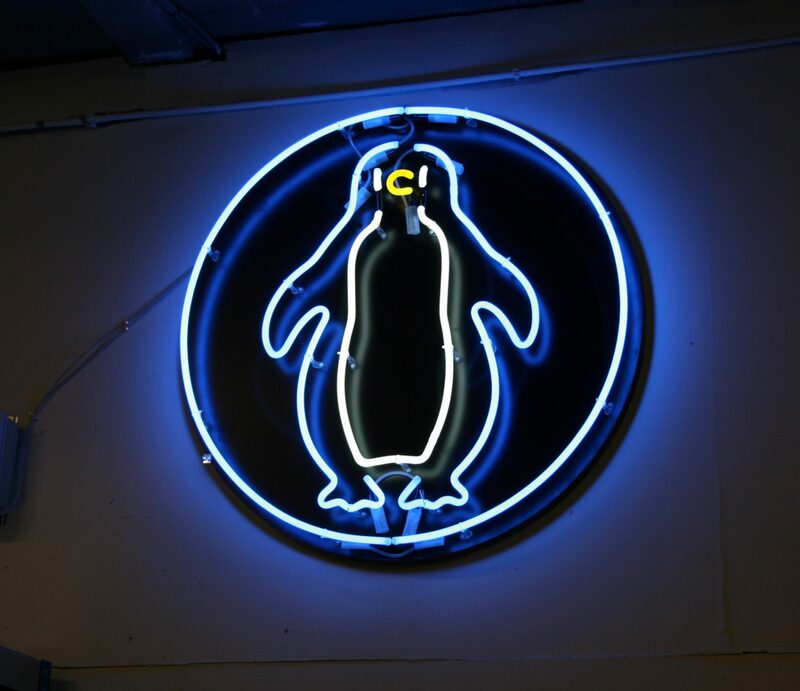 All internally illuminated with blue LEDs. 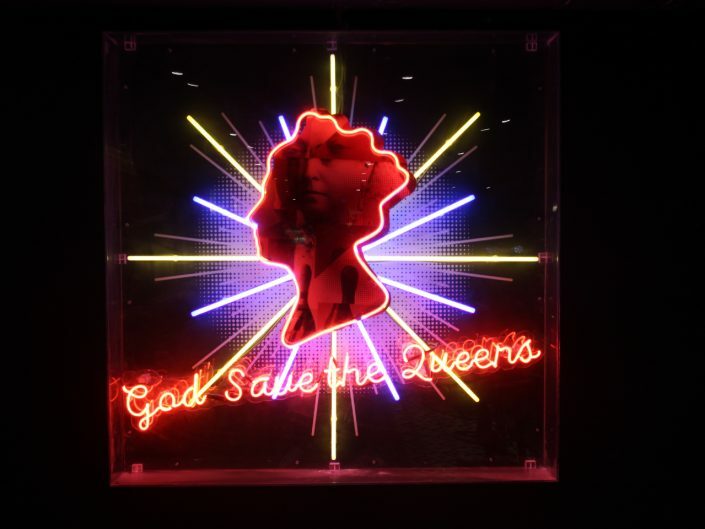 The ‘God Save the Queen’ illuminated artwork was produced using multi-layered coloured neon mounted to a clear acrylic digital print, encased in a poly-carbonate boxed case. 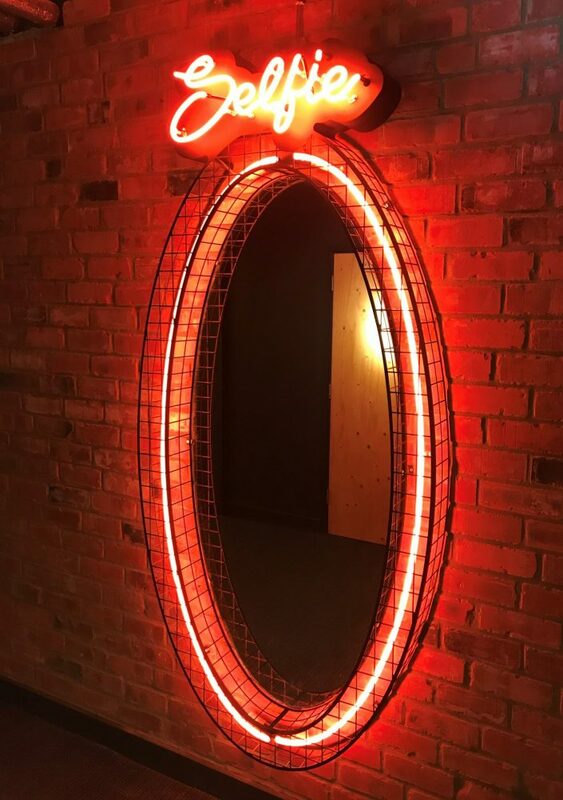 A quirky ‘selfie’ mirror was fabricated with cold cathode neon tubing and a bespoke custom-made CNC routered protective mesh frame. 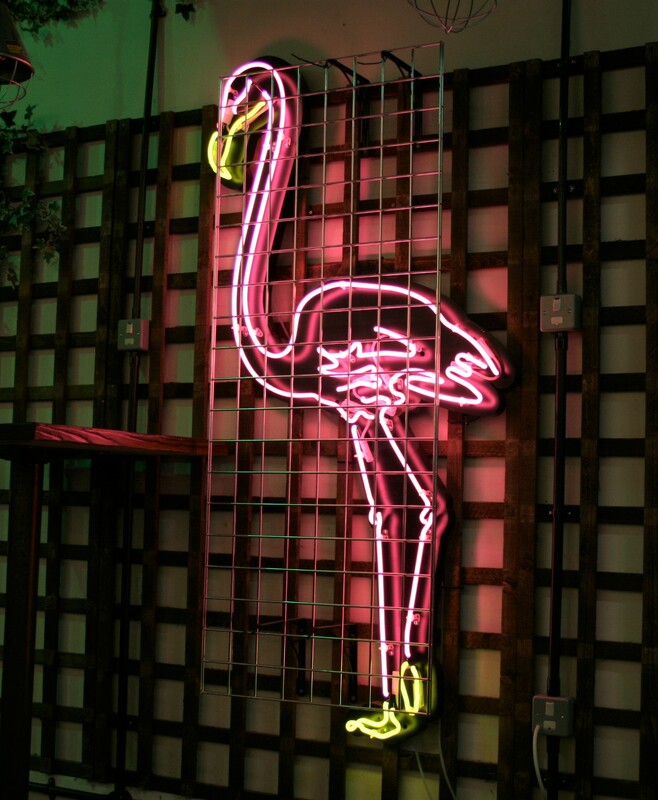 A stylish neon pink flamingo was created with cold cathode neon tubing for a visually striking effect. 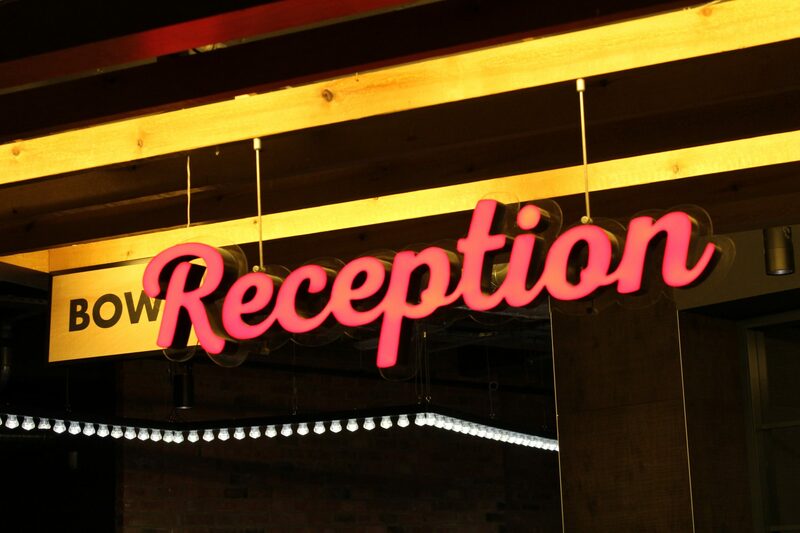 The entrance welcome sign was constructed with a folded aluminium powder coated panel, illuminated with cool white LEDs. 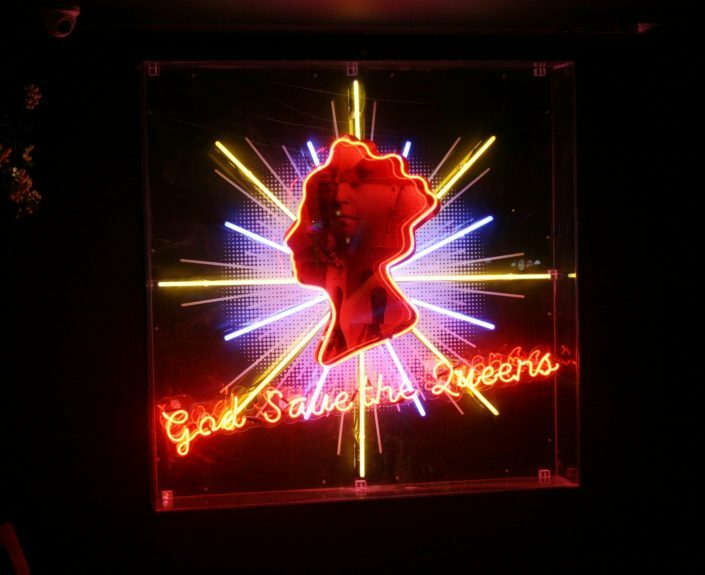 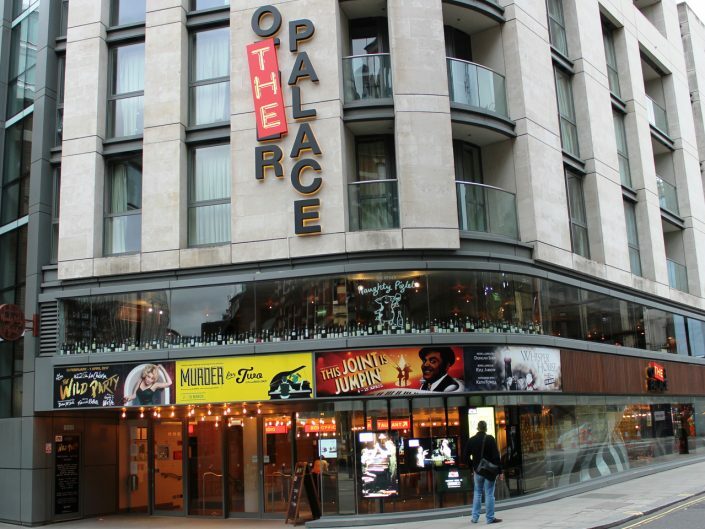 The sign is housed internally with the addition of decorative cabochon bulbs mounted to the frame to give a theatrical flair. 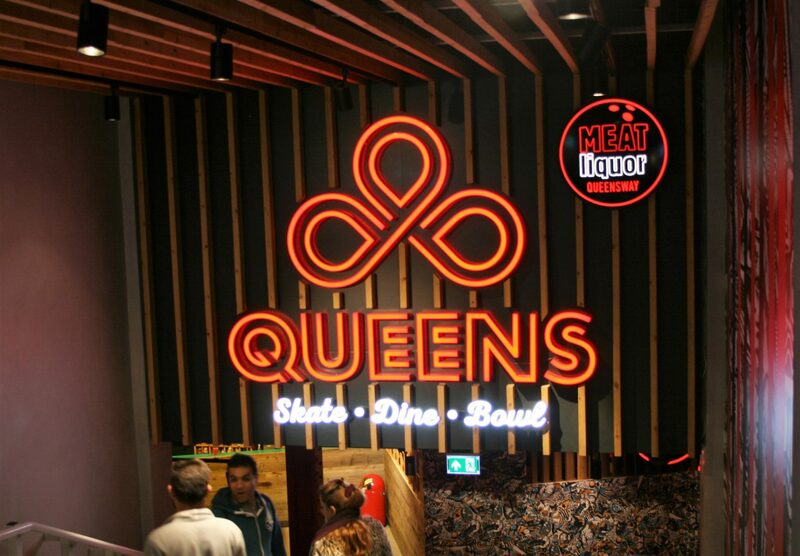 The Queens reception interior signage was produced using built-up rimless aluminium letters, internally illuminated with red LEDs. 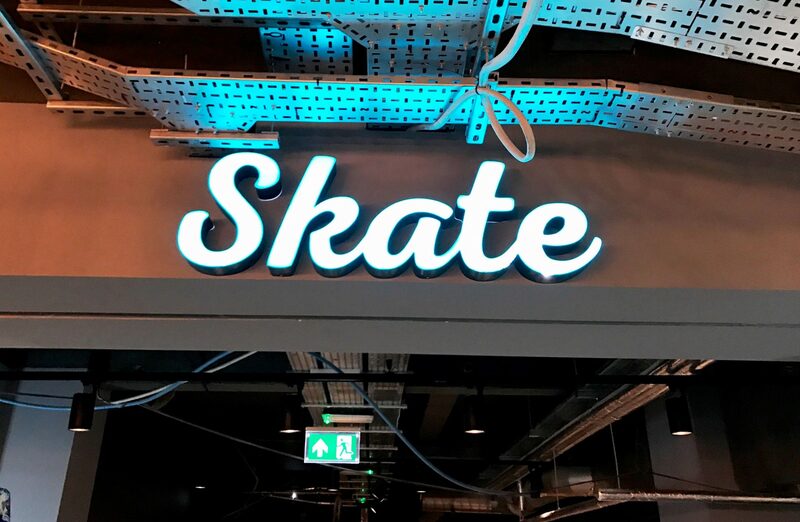 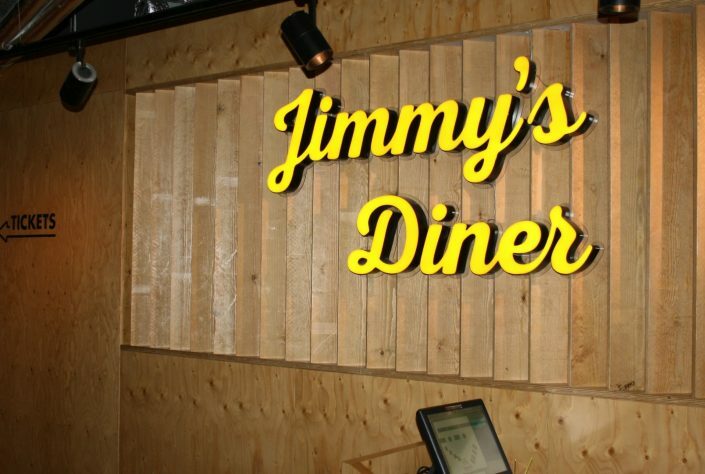 The 3D letters were mounted to a clear acrylic carrier panel and suspended via a rod system.